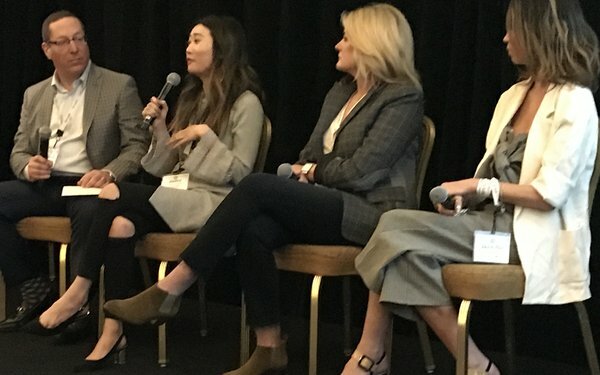 Lori Gatto (second from right), VP of Marketing at TomBoy X, tells the audience at this morning’s MediaPost Brand Insider Summit D2C that when she came to this smaller D2C company that sells underwear from a more established company, she wanted to build expertise in-house. Since TomBoy X is seeing “tremendous growth,” she said, instead it is relying on agencies to help with social media and search. “Working with an agency has allowed us to scale. It brings the creative that we need on social and on the media side. As the brand has gotten larger, Gatto is looking to build expertise in-house. “It starts with recruiting and finding good talent. The next wave is to bring that in. On the creative side, our founders enlisted help on a project basis, to establish brand. We have hired an art director and a content manager in-house. “We’re stable with what we’ve got on social and search but we want to scale up, and we’re getting funding to build on top of where we’re at,” Gatto said. “I am looking to bring in some technology solutions, and startegic partners. But there are time when you just may not have the resources. Others on the panel were, left to right, moderator Rich Zeldes, EVP-Managing Director, Stella Rising; Jadey Chow, VP, Brand Marketing, Curology; and Jennifer Muse, Global eCommerce & CRM Manager, General Mills.